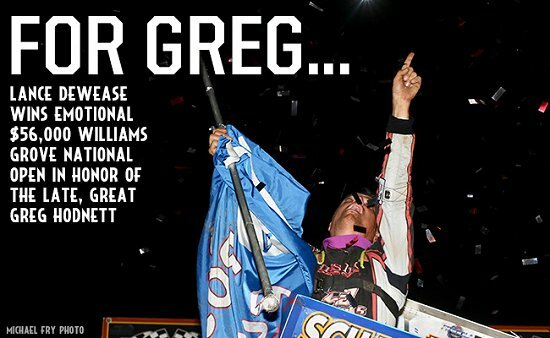 Gravel won the first of two Sears Craftsman Dashes to the earn the pole for the Feature, which went 27 laps in honor of five-time Williams Grove Track Champion and 1993 World of Outlaws Rookie of the Year, Greg Hodnett. Gio Scelzi won the second Dash to start outside the front row. Gravel got the jump on the initial start and led the opening circuit with Scelzi in tow. Logan Schuchart, while running third, brought out the first caution of the evening, coming to a stop on the backstretch with five laps complete. That set up the first of three double-file restarts. Gravel elected the bottom on this one, putting Scelzi to his outside. Gravel remained out front on the restart, but it was evident that Scelzi was a threat as he stayed right with the CJB Motorsports No.5 around the paperclip shaped half-mile. 2017 Track Champion Freddie Rahmer maneuvered his way into third from eighth and tried to close in on the lead duo. Sheldon Haudenschild brought out the caution with 11 laps complete and this time Gravel elected the top on the double-file restart. Again, Gravel remained out front as Scelzi took a peak underneath for the lead once again. Carson Macedo, aboard the Jason Johnson Racing No.41, brought out the final caution of the evening on Lap 15. Gravel elected the bottom on the double-file restart, once again giving Scelzi the outside. Gravel entered high into turn one and tried to catch momentum to get a run off of turn two. Scelzi pitched his Indy Race Parts No.71 hard to the bottom, couldn’t complete the slide job, but maintained speed on the bottom and pulled even with Gravel under the bridge and edged in front heading into turn three. Scelzi, now in command of the field, powered away to lead Lap 16. Lucas Wolfe moved by Freddie Rahmer into third and set his eyes on the leaders. For the first time, the leaders would reach lapped traffic as Gio Scelzi’s job was far from done. Scelzi approached traffic and Gravel closed in, looking to steal a win from the young California native. With two to go, Gravel was within three car lengths as Scelzi continued to run the cushion through traffic. Gravel pitched the car hard into turn three before coming to the White Flag. 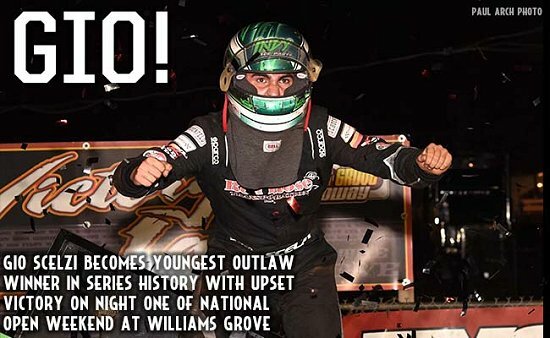 With Scelzi carrying speed on the cushion and a lapped on the bottom, there was no room for Gravel to make a last-ditch effort, as Gio Scelzi crossed under the Checkered Flag .732 seconds ahead of Gravel to become the youngest World of Outlaws winner in the Series 40-year history. “I don’t think I am ever going to believe this one,” Scelzi said in Victory Lane when track announcer Bruce Ellis asked him about the night. “I was so good at the beginning, I was afraid I wouldn’t be any good at the end. David is good here, he’s a two-time National Open winner,” Scelzi, engulfed in positive emotion, said. “I don’t know what to say, we could work anywhere. Hopefully we can Qualify good tomorrow and see what we can do,” Scelzi, who was grinning cheek-to-cheek, added about his chances tomorrow for the $56,000 payday. David Gravel settled for second and was understandably disappointed. Lucas Wolfe was the highest finishing local and also applauded young Scelzi, “What a tremendous result for him, congrats to him. It wasn’t a bad night for us, we passed some good cars to get up here and hopefully we can do a little better tomorrow,” Wolfe said. After Scelzi, Gravel and Wolfe crossed the finish line, Freddie Rahmer and Tim Shaffer got together battling for fourth, resulting in Shaffer ending up backwards at the bottom of turn four, bringing out the Yellow and Checkered simultaneously. Unfortunately for Shaffer, who was a couple hundred feet from a top-five finish, as the cause of the yellow, he was scored as the last car on the lead lap, which was 21st. Freddie Rahmer officially finished fourth with 12th-starting Shane Stewart completing the top-five. Donny Schatz earned KSE Hard Charger Honors coming from 22nd to complete the top ten. Logan Schuchart set Quick Time over an outstanding field of 50 cars, worth $327 courtesy of Fast Tee’s. Schuchart generously donated his bonus to Sherry Hodnett. Schatz’s effort also earned him a $500 bonus courtesy of Wicked Cushion, which he generously donated to the Hodnett family as well. The World of Outlaws Craftsman Sprint Car Series returns to Williams Grove Speedway tomorrow night for the $56,000 to win Champion Racing Oil National Open. Tonight’s results have no bearing on tomorrow’s program. 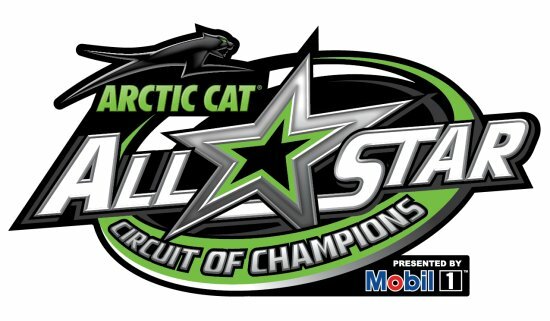 If you can’t make it to the track, watch all the action LIVE on DIRTVision.com! 17.390; 6. 13-Paul McMahan, 17.504; 7. 27G-Jay Galloway, 17.687; 8. 1. 24-Lucas Wolfe, 16.829; 2. 55K-Robbie Kendall, 17.016; 3. 1. 69K-Lance Dewease, 16.584; 2. 87-Aaron Reutzel, 16.635; 3. 17.064; 4. O-Rick Lafferty, 17.069; 5. 11-Ryan Smith, 17.083; 6. Conley ; 7. 27G-Jay Galloway ; 8. 12W-Troy Fraker ; 9. Blaney ; 7. 35-Tyler Esh ; 8. 22-Brandon Spithaler ; 9. McIntyre ; 4. 87-Aaron Reutzel ; 5. 27-Greg Hodnett ; 6. 1. 14-Tony Stewart ; 2. 11-Ryan Smith ; 3. 1X-Chad Trout ; 4. Montieth ; 7. 24-Lucas Wolfe ; 8. O7-Gerard McIntyre ; 9.
; 12. 13-Paul McMahan ; 13. 39M-Anthony Macri ; 14. Macedo ; 17. 14-Tony Stewart ; 18. 55K-Robbie Kendall ; 19. Bower ; 25. 22-Brandon Spithaler ; 26. 39-Cory Haas ; 27. Larson ; 7. 27-Greg Hodnett ; 8. 4-Brock Zearfoss ; 9.
; 20. 75-Nicole Bower ; 21. 22-Brandon Spithaler ; 22.
; 25. 48-Danny Dietrich ; 26. 55K-Robbie Kendall ; 27.